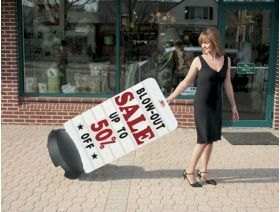 The Tip 'N Roll® Changeable Message Board Deluxe Sidewalk Sign is a portable, hassle free rolling sidewalk sign. It works to get your personalized messages seen and looks great. The changeable letter message board on a 24" x 36" sign board and has tracking for 7 lines of letters on each side of the sign and also comes with jumbo sized 8" numbers & SALE/Special headers. The Tip 'N Roll® Rolling Sidewalk Signs and Message Board is compact with a low-profile techno-polymer base with integrated built in recessed 2” wheels that easily roll on almost any surface and eliminates having to lift and carry the sign. The 24 inch diameter platform fits and rolls easily through any standard door. 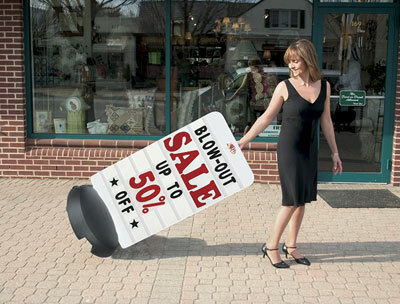 Just tip/tilt and roll this portable, affordable sidewalk sign where needed. 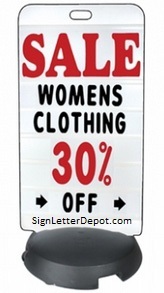 2-sided with solid white 24" x 36" sign tracked sign board. 1 - (600 x 900 x 10mm) 24" x 46" x 0.5” solid white sign board with tracking for 7 lines for letters on each side.